Looking for the best dog beach in San Diego? There are several great ones to choose from, both in San Diego and North County. Check out the dog beach map and descriptions of the dog beaches below, and choose the best one for you and your dog! Dogs love the beach, especially if they can run off leash. Not all beaches are dog friendly, so check out our list of the best dog beaches in the San Diego area. I've used Google Maps to create a map of the dog beaches in San Diego. If the legend doesn't show up on your computer, then click on the link below the map and it will open in Google maps. Coronado Beach in San Diego is rated one of the top 10 beaches in the world. This is definitely one of the best beaches in Southern California. Located on beautiful Coronado island, the northern end of Coronado Beach next to the Naval Air Station is a San Diego dog beach for unleashed dogs. The beach is wonderful and there is an area to hose your dog off when you are done (see photo below). Most of Coronado Beach is not dog friendly, but this is a great place. From Interstate 5 in San Diego take CA-75 S toward Coronado and go over the Coronado bridge. Continue on Third Ave. to the end and turn left on Alameda Blvd., right on Marina Ave., and turn right on Ocean Blvd, and look for parking at the end of the road. Located on Ocean Blvd. near Sunset Park. Keep you dog on a leash until you arrive at Dog Beach. Bring your dog to Fiesta Island in Mission Bay to run around unleashed in the sand or in the calm waters of Mission Bay. This is another good dog beach in San Diego. The north end is nicer. If you have a horse, this is also a great place to ride your horse on the beach. This is open 24 hours, but after 10 PM you can only enter or exit through a walking gate. Click on the horses above if you would like them to sing. If you are lucky, you may see these singing horses when your ride your horse on Fiesta Island. From Interstate 5 in San Diego take exit 21 to merge onto Sea World Drive. In 0.5 mi turn left at Fiesta Island Rd. When most people think of dog beaches in California, they think of the Dog Beach at the northern end of Ocean Beach. 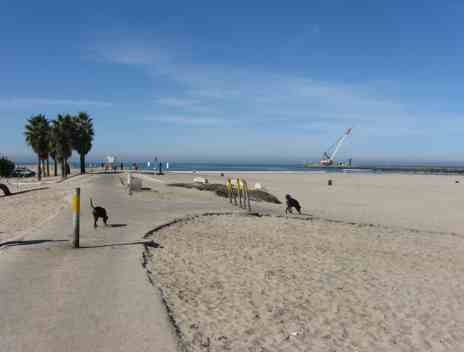 This is the original California dog beach, open 24 hours, and unleashed dogs are welcome. 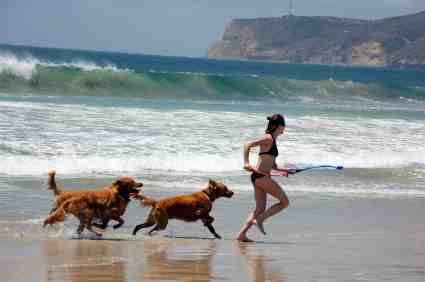 It is a very popular San Diego dog beach with lots of room to run around. Just remember, not all of Ocean Beach is dog friendly - only the northern portion located at the west end of the San Diego River Floodway. Don't be afraid to let your dog get wet and dirty, because nearby is the Ocean Beach world-famous Dog Beach Dog Wash, a self-service dog wash open 7 AM - 9 PM. Located at 7733 Voltaire St. just two blocks away from Ocean Beach Dog Beach. From Interstate 5 take the Sea World Drive exit 21, toward Tecolote Road. Turn right on Sea World Drive, which becomes Sunset Cliffs Blvd. Turn right on Voltaire Street. There is a public parking lot. Or take Hwy 8 West until it ends and then it becomes Sunset Cliffs Blvd. 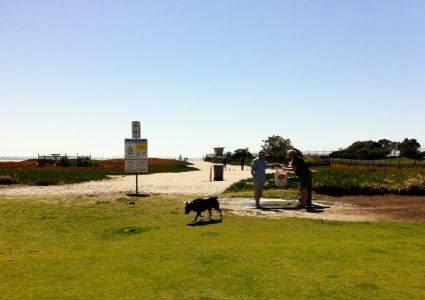 Then make a right turn onto Point Loma Blvd and follow the signs to Ocean Beach's Dog Beach. The Del Mar beaches are beautiful, some of the best beaches in San Diego. They also are good San Diego dog beaches, but the dog rules are a little complicated. North of 29th street from the day after Labor Day through June 15 dogs are allowed unleashed. The rest of the year leashes are required. I’ve actually found two nice Del Mar San Diego dog beaches north of 29th street. This one is nice and has free parking, a rarity in Del Mar. 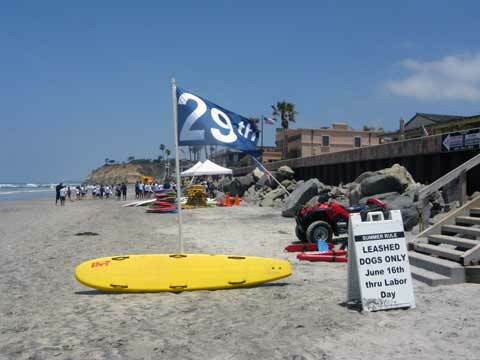 In addition, Del Mar Power House Park to 29th street allows leashed dogs the day after Labor Day through June 15. Also Del Mar South of Powerhouse Park to 6th street allows leashed dogs all year around. Like I say, the dog rules are a little complicated in Del Mar, but these are nice dog beaches in California. From the north exit Interstate 5 at Via de la Valle and go west. Turn left on historic 101, which turns into Camino del Mar. From the south exit Interstate 5 at Del Mar Heights Rd. and go west. Turn right on Camino del Mar. At Camino Del Mar and 29th Avenue there is a small free parking lot on the west side of Camino Del Mar. There is also free street parking in this residential area. Through the parking lot is the beach access. The signs clearly mark 29th street, so if you have a dog with you, go north. There is plenty of beach to enjoy. The Del Mar beaches are beautiful, and this one is a good dog beach in San Diego, but the dog rules are a little complicated. North of 29th street from the day after Labor Day through June 15 dogs are allowed unleashed. The rest of the year leashes are required. This is the second of two Del Mar dog beaches north of 29th street. This San Diego dog beach is called Rivermouth Beach. The beach is fairly deep with lots of volleyball courts. In addition, Del Mar Power House Park to 29th street allows leashed dogs the day after Labor Day through June 15. Also Del Mar South of Powerhouse Park to 6th street allows leashed dogs all year around. 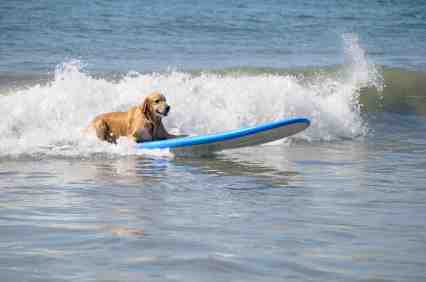 Like I say, the dog rules are a little complicated in Del Mar, but these are top beaches in California. Located on 101 just south of Via de la Valle, behind the Del Mar fairgrounds. From Interstate 5 freeway, exit Via de la Valle and head west. Go Left on Historic 101 and park on the right. There is street parking which costs $2 per hour. Just north of Solana Beach on historic 101 is Seaside or Cardiff State Beach. This San Diego dog beach allows leashed dogs. During the week it is not very crowded, and is popular on summer weekends. From Interstate 5, take the Lomas Santa Fe exit and go west. Turn right on historic 101. Park in the south parking lot. There is an $8.00 parking fee unless you have a California State Park pass. There is also limited free street parking on the west side of 101 if you are coming from the north. With the exception of the San Diego beaches spotlighted above, most beaches in San Diego area do not allow dogs during popular summer season and popular hours (9:00 – 6:00). •	Imperial Beach north of Palm Ave. and south of Imperial Beach Blvd. 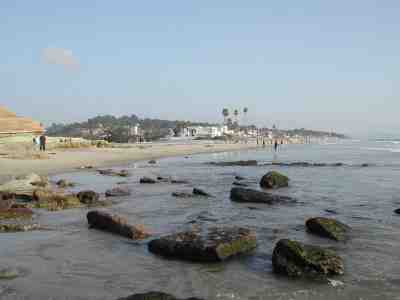 Many of the beaches in San Diego have their own rules as they are located in different towns in San Diego county. If you find other dog-friendly beaches, let me know and I’ll share those with others. •	If a leash is required, please make it a 6-foot leash. This is required at many of the beaches. •	If a leash is not required, your dog must be under voice control. •	You are required to pick up after your dog. Most beaches provide bags for this purpose, but in case they don’t, please bring your own waste bags. •	Dogs must be licensed and vaccinated. •	You are responsible for your dog, so if your dog is not friendly to strangers or other dogs, don’t bring him!